Summer offers good health and food on a platter, and it feels as though it is simply up to us to open our arms and embrace the abundance. From long days to get outside and explore, exercise and breathe fresh air to fresh produce begging to be savored if only we knew what to do with it all, good health is right at our fingertips during the summer season giving us all an opportunity settle into a worthwhile everyday routine. Zucchini has always been one such ingredient that is abundant but I don’t have many ideas of what to do with it besides roast it. 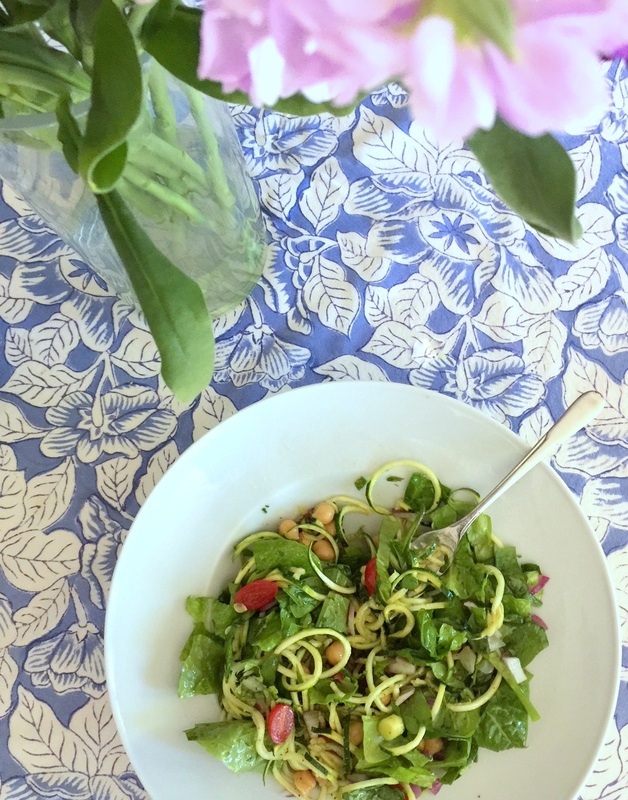 As well, I’ve been challenging myself to reduce the amount of pasta I eat, even whole wheat pasta, and so it was a welcome surprise upon visiting a dear friend a few weeks ago, that her daughter whipped us all up a zucchini noodle salad topped with lemon basil vinaigrette. 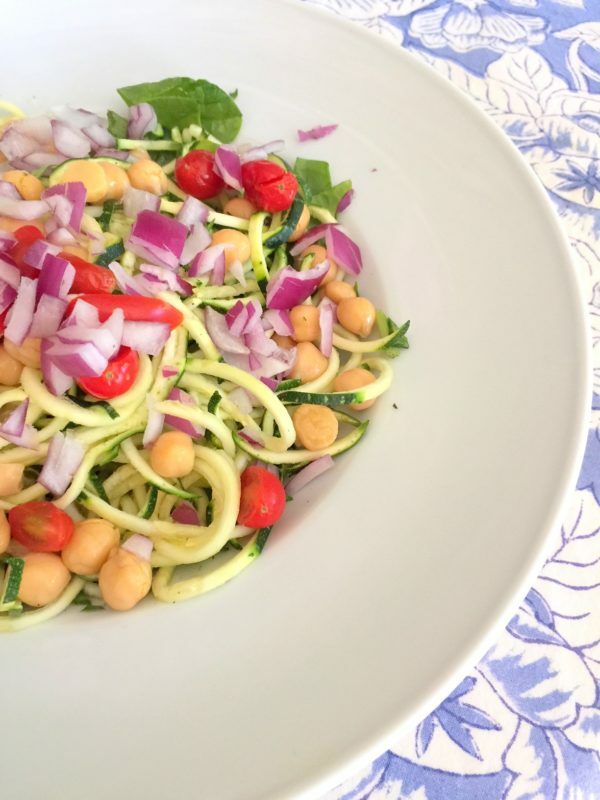 First of all, zucchini noodles were not in my wheelhouse, and so I took a look at the spiralizer that works the magic on an array of vegetables. A simple device (some Kitchen-Aid products have a blade that enables the spiraling – be sure to check if yours is compatible) offering a basic concept (the noodle), and after enjoying the salad which was tossed with garbanzo beans, red onion, grape tomatoes and arugula (choose the greens you love – I used a couple different greens from my refrigerator and garden), the texture of the noodles satiated me as a pasta would. I was officially a fan. For only $19.99 I picked up a spiralizer and made my first salad last week. In fewer than 10 minutes, this salad is made and ready to enjoy. Both of my friends daughters suggested adding some additional protein by tossing grilled and sliced on the diagonal chicken, which would make a complete and delicious meal. I cannot thank enough Sophie, Emily and Nancy for one of my favorite additions to my summer eating menu. Make the vinaigrette by placing all ingredients, except the olive oil into the bottom of the salad bowl. Whisk together. Add the olive oil, whisking to incorporate and blend. Add all of the salad ingredients on top of the dressing. Toss to dress the ingredients. Serve and enjoy! Optional: To make a complete meal, top with grilled slices of chicken or any other protein. This looks so amazing. I can’t wait to try this recipe with fresh basil from our garden. Thanks for sharing! Enjoy! It is so simple. 🙂 And most important – delicious! This recipe was just what I was looking for to use up some leftover zucchini. 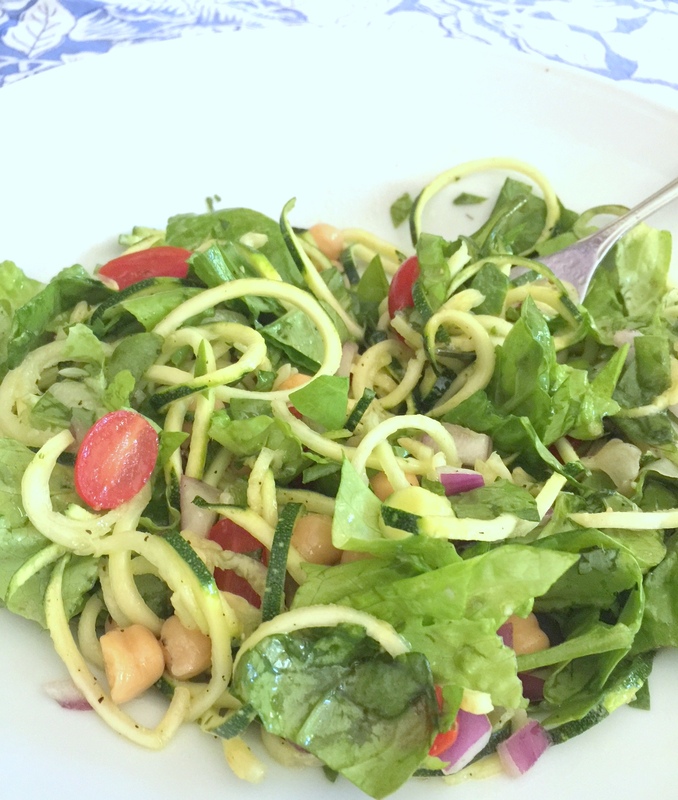 Fresh and crisp, this salad was truly a perfect summer meal. Thank you for sharing this easy recipe! Thanks, Shannon for another great looking recipe.